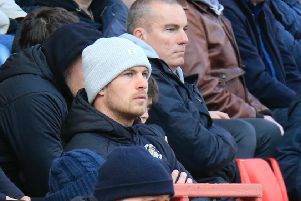 There was precious little, if any, festive cheer at Kenilworth Road this afternoon as Luton Town produced a truly insipid display, comfortably and deservedly beaten by Wycombe Wanderers. For the second game in succession on home soil, the Hatters players found themselves booed off by majority of the 9,676 supporters who had witnessed a third successive loss after what was a thoroughly dispiriting performance from pretty much the first whistle. Bar claiming one deep cross, visiting keeper Matt Ingram had precisely nothing to do all afternoon, as if home fans were expecting a Christmas cracker, they were left sorely disappointed. Hatters caretaker boss Andy Awford selected an unchanged side from 3-2 victory against Exeter City, although his chances of getting the job on a full-time basis are surely slim to none after the 90 minutes. In front of bookies favourite David James, who was watching from the confines of the directors box, Luton had a decent chance early on as Cameron McGeehan lofted over. However, Wycombe went close as Magnus Okuonghae failed to deal with a ball over top and ex-Hatter Michael Harriman, who impressed all afternoon in a far more attacking role than he had at Town, shot off target. The hosts’ defensive frailtiies then returned as they never once looked confident at the back, with Okuonghae in particularly a bag of nerves at times, and that uncertainty spread to his team-mates. Luton struggled to get any real passing moves of note, Paul Benson failing to extend himself to turn in Craig Mackail-Smith’s cross shot. Hatters did fashion one good opportunity when Olly Lee burst forward from midfield and produced a lovely reverse pass for Mackail-Smith whose dink was headed wide by Benson. A sprint from Harriman ended with a clever ball to Paul Hayes who was denied smartly by Mark Tyler at the near post, while Sean Long made a superb block to stop Hayes opening the scoring from close range after Jason McCarthy’s low delivery. The resultant corner reached Anthony Stewart at the far post but his aim was off, volleying into the hoardings. After the break, Wycombe again looked more dangerous from the start, with Garry Thompson’s attempt forcing Jake Howells into a fine sliding intervention. The Chairboys were then rewarded on 51 minutes as Harriman sent over a cross and Cuthbert got in a muddle trying to clear, Thompson nipping in to round Tyler and tap into the empty net. The most frustrating aspect was that Luton had just looked to be just gathering a head of steam, as Lee tried to mount a response, his half volley always rising over the top. For the second successive week, the linesman went down injured and after a five minute stoppage in which he was replaced, Luton were then caught cold as play resumed. There was a hint of controversy in the build-up as McGeehan looked to have been clearly pushed while going for a header allowing Wycombe to break away. However, there no was no excuse for what followed as Thompson strolled away unchallenged on the right flank, and picked out the completely unmarked Hayes, who sent a downward header beyond Tyler. Mackail-Smith was inches away from an absolutely stunning way back for Town, volleying on the turn from 25 yards out, beating Ingram all ends up, only to see his attempt fly inches wide. Awford rung the changes on 70 minutes, bringing on Jack Marriott, Josh McQuoid and Luke Guttridge, but still little improved. McQuoid came closest at the back post, not getting enough purchase on Guttridge’s hanging cross, while two off target attempts from McGeehan and Howells summed up Luton’s completely inept offering. Hatters: Mark Tyler, Sean Long, Jake Howells, Magnus Okuonghae, Scott Cuthbert (C), Alex Lawless (Josh McQuoid 70), Olly Lee, Danny Green (Luke Guttridge 70), Cameron McGeehan, Craig Mackail-Smith, Paul Benson (Jack Marriott 70). Subs not used: Elliot Justham, Jonathan Smith, Frankie Musonda. Chairboys: Matt Ingram, Joe Jacobson, Anthony Stewart, Aaron Pierre, Garry Thompson, Paul Hayes (C Max Kretzschmar), Matt Bloomfield (Stephen McGinn 90), Sam Wood, Michael Harriman, Luke O’Nien, Jason McCarthy. Subs not used: Sido Jombati, Aaron Amadi-Holloway, Danny Rowe, Alex Lynch, Jermaine Udumaga.